There are two places you can change or update your email account password: in Outlook and with your email provider (for example, Office 365, Gmail, Yahoo, iCloud, or Xfinity). You may need to change your password one or both places. Why are there two places to change my password? There are two things you need in order to access your email. When you change your email account password, you first change your password with your email provider, then update the password stored in Outlook. When should I change my password with my email provider? See the following sections for instructions on changing your email account password for several major email providers. If your email account provider isn't listed, contact your admin or the email provider's help desk. Click your picture in the upper right corner of the screen, then select My Account. Scroll down to Signing in to Google. 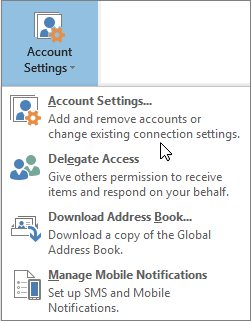 There you can change your password and then select App passwords to generate a unique password to enter into Outlook 2016, Outlook 2013, and Outlook 2010. Gmail requires the use of two-factor authentication and an app password to check your email in Outlook. For more information, see Set up two-factor authentication for Gmail. Go to the Yahoo website. Click your name or picture in the upper right corner of the screen, then select Account Info. You may need to click the name of your account on the next screen. Follow the prompts to select your account name and enter your existing password. If you forgot your password, click I forgot my password. On the left side of the screen, click Account security, then click Change password and follow the prompts. When you're done, scroll down to verify that Two-step verification is on, then click Manage app passwords. For more information about generating a unique password to enter into Outlook 2016, 2013, and 2010, see Set up two-factor authentication for Yahoo. Go to the Apple ID website. Enter your Apple ID and Password and then click the arrow. If you forgot your password, click Forgot Apple ID or password? and follow the prompts. If iCloud requires you to enter a Two-Factor Authentication code, obtain the code from one of your other Apple devices and enter the six digits, then click Trust when iCloud asks you to trust this browser. Click the drop-down next to your name and picture in the upper right corner of the screen. At the top of the next screen, click Manage under Apple ID. You may need to enter your Apple ID and password again. Under Security, click Change Password... and follow the prompts. When you're done, scroll down to verify that Two-Factor Authentication is on, then click Generate Password under App-Specific Passwords. 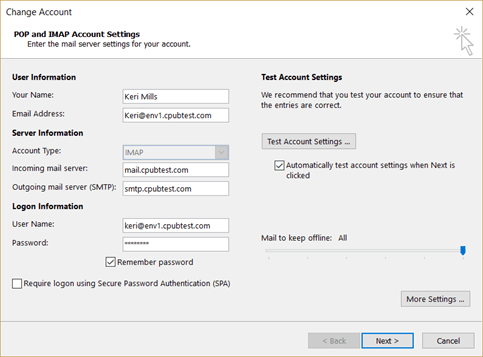 For more information about generating a unique password to enter into Outlook 2016, 2013, and 2010, see Set up two-factor authentication for iCloud. Other email accounts will require you to change your email account password on the website for the account provider. For example, to change the password for an Xfinity account, go to the Xfinity website and follow the prompts. Every email account provider has slightly different steps for changing a password. To update your password in Outlook, use the following steps. Note: Outlook can't change the password with your email provider. In other words, if you forget your Outlook.com password, you'll first have to see the section Change your Outlook.com password to change the password Outlook.com has for your account, then update the password in Outlook for Windows. There are two possible ways to update your password in Outlook. The specific steps you need to take depend on your version of Outlook and whether you're an Office 365 subscriber or purchased Outlook as a standalone application. In Outlook, choose File > Account Settings > Update Password. Update the password or app password and click OK. In the Change Account window, update your password. Select Close after Outlook tests your account settings, then Finish > Close to return to Outlook. Does my email account need an app password? 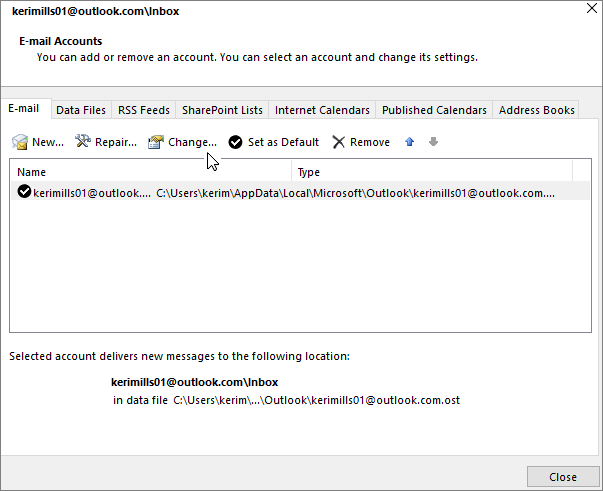 If you use Outlook to send and receive email from your Gmail, Yahoo, iCloud, Apple, Outlook.com, or @me.com accounts, you may not use your regular email account password to set up these accounts. These email providers may require you to use two-factor authentication and an app password. This is a one-time password that you enter in place of your regular account password when setting up your account for the first time. For more information, see the sections on setting up two-factor authentication for Gmail, Yahoo, and iCloud. To update your password in Outlook for Mac, use the following steps. On the Tools tab, select Accounts. In the left pane, select the account you want to change the password for. Close the Accounts window. Outlook will save the password automatically.